The pavé may lay in France, but Paris-Roubaix is seen as a Flemish race by even the most Belgian of racers. 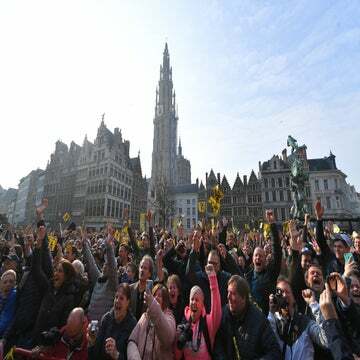 GENT, Belgium (VN) — The Ronde van Vlaanderen might be the most important race in Belgium, but a surprising number of Belgian riders say they’d rather win Paris-Roubaix. Heresy? Maybe not, says Yves Lampaert, who is part of that tribe of Belgians who look lustfully over the French border. If you’re a cobble-eater, Roubaix is king. The endless sectors of rough-hewn French pavé are something mystical to the riders focusing on the northern classics. Winning Flanders might confirm your status within the Belgian cycling hierarchy, but winning Roubaix puts you on front pages around the world. The 28-year-old Lampaert is as Belgian as they get. He hails from Izegem, not far from the cobbles of Roubaix. He had enough class in the ruthless junior scene to get noticed. As a U23 rider, he rumbled across the French stones as much as he did those of Belgium. He got bitten by the Roubaix bug early. And even though Paris-Roubaix is firmly held on French roads, the nearby Belgians almost consider it as a natural extension of their cycling domain. If there are cobbles, the Belgians want to shine. Lampaert will line up Sunday as a second-tier favorite. Teammates Philippe Gilbert and Zdenek Stybar might be slightly ahead of him in terms of pecking order, but Lampaert is proving his worth and finding his place on the hyper-competitive Deceuninck-Quick-Step team. He won back-to-back editions of Dwars door Vlaanderen, and was seventh in the 2015 Roubaix. Despite Lampaert’s relative compact build (by Flemish standards), he considers Roubaix a better race for him than Flanders. And despite the explosiveness of the Flanders course, with its cobblestoned climbs, Lampaert said Roubaix is the harder race. Lampaert said the team will enter the race with a game plan, but in a race as chaotic and unpredictable as Roubaix, everyone must be ready to adapt and attack. If he gets the green light, he’ll hit the accelerator. Ever the generous teammate, last year after he won the Belgian national road title, Lampaert bought garden tractors for all the riders who helped set him up. What will he buy his DQS teammates if he pulls off Roubaix?